Four residents of Belize City were busted at about 5:30 p.m. Thursday at the northern border with 6 and a half pounds of compressed weed which they were attempting to smuggle into Belize from Mexico. An alert Customs officer searched their vehicle, a Chrysler van, driven by Derrick Thompson, and found three bags. When Customs opened the three bags, they found cannabis in them, and the drug was weighed at the Corozal Police Station and found to weigh 3,082 grams. 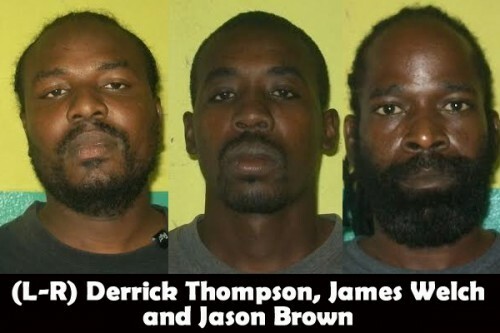 Derrick Thompson, 32, of Iguana Street, Belize City; Keisha Garnett, 36, a domestic of Welch Street; James Welch, 25, a laborer of Logwood Street; and Jason Brown, 36, a laborer of Welch Street, were all arrested by Corozal police and charged with drug trafficking and the importation of a controlled drug. Today they were all taken to the Corozal Magistrate’s Court, where they pleaded not guilty to the charges and were offered bail of $6,000 and a surety of the same amount, which they were able to meet. They were ordered to return to court on Wednesday, May 21.